Wanna eat like a Viking? Make Gravlaks, an authentic Norwegian food that will please your palate. Connoisseurs from all over the world are familiar with this Norwegian delicacy. 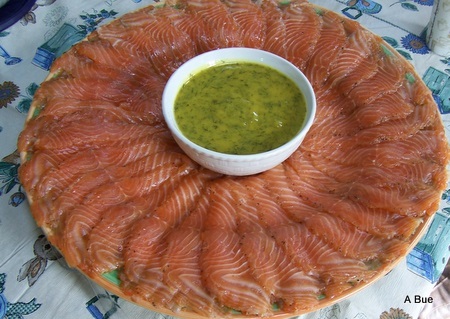 It is usually served with mustard sauce (senneps saus in Norwegian, also called Hoffmester Saus. When I visit my brother Bjorn and his wife Gerd, they often serve Gravlaks. Gerd is a great cook and Bjorn is an expert at slicing the fish very thin at an angle. 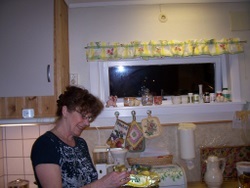 Gerd willingly shares her recipes with me. If you follow these directions step-by step, the result should be a price winner. Place salmon fillet in deep glass baking dish, skin side down. Cover fillet with chopped fresh dill. In separate bowl, mix salt, sugar, pepper and lemon juice. Add this evenly over dill covered fillet. Add second half of salmon fillet - skin side up. Cover fillets with plastic wrap. Wrap a board (slightly larger than salmon) in plastic and place over fish. Place weight (4 cans about 4 pounds or more) on board to press down. Refrigerate (immediately). Keep in refrigerator for 3 days - turning fish over every 6 hours; separate fillets - baste both sides each time with sauce from bottom of pan. Replace weights and refrigerate immediately. After 3 days - remove fish from sauce, scrape away dill and seasoning. Pat dry with paper towels. Place salmon fillets skin side down and cut even thin slices at an angle. Piquant Mustard Sauce. Garnish with sprigs of fresh dill, lemon wedges and thinly sliced red onions. Click here to see more Norwegian Recipes.